PowerPoint 2010 Intermediate Training Materials are designed for trainers to develop the workforce PowerPoint 2010 skills at the intermediate level. Confidently train employees how to publish to a pdf, convert presentations from legacy formats, and create slide transitions, animations and more! Seeing is Believing This sample manual to teach PowerPoint 2010 - Intermediate is in MS Word format. The use of PowerPoint 2010 in any business or organizational setting is extremely beneficial. PowerPoint is the industry standard for presentations at conference gatherings, client sales meetings and executive discussions. With an endless list of advantages when using PowerPoint you'll find that doing your presentation with PowerPoint will be easier, more engaging, and for those in attendance, more entertaining. 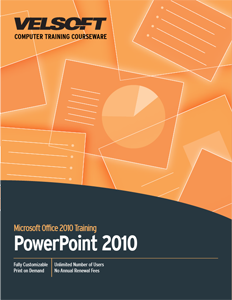 Our Courseware for Office PowerPoint 2010 is an excellent resource for instructors and students. Our team of writers has created customizable Courseware to accurately and effectively teach the functions and features of Office PowerPoint 2010. Experienced and inexperienced students alike will benefit from this well organized, and detailed guide for Office PowerPoint 2010. After you download your free sample and see how easy the courseware is to use, and knowing that there are no hidden fees, you'll know that you are teaching with proven materials that will let you teach PowerPoint 2010 to your fullest potential.